A poor, oversized and under-educated teenager is recruited by a major college football program where he is groomed into an athletically and academically successful NFL prospect. If I'm tepid about everything here, it's for good reason. This movie doesn't even really warrant a real response. All the drama is forced, predictable, and interchangeable in the plot. It works just well enough to make this watchable. 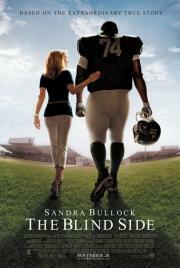 Unlike something like Remember the Titans which has a solid cast, this is devoid of anything of note. ... and then it hit me: Man, I sure don't hope that this movie winning an oscar, lead to a surge of white women in cars, riding around looking for random black kids: -"Are you homeless, sweetie?" -"No, I'm actually on my way to.." -"GET IN THE CAR YOU ARE SLEEPING AT MY HOUSE NOW YOU POOR THING!" One of the most overrated movies in recent memory.